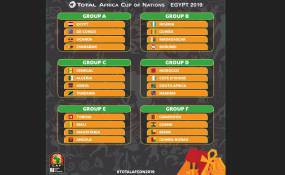 Three times Africa Cup of Nations champions, Nigeria has been drawn into a relatively easy group according to the draws made yesterday in Cairo, Egypt. The Super Eagles of Nigeria will be playing in Group B alongside DR Congo, Uganda and Zimbabwe, which on paper, Nigeria should have a relatively easy passage to the next stage. Reacting to the draws, Super Eagle Manager, Gernot Rohr said he was satisfied with the draw and hope that Nigeria would progress from the group without much difficulty. "We have a very young team, but without sounding overconfident, we are confident that we will progress," Rohr said. He however hoped that none of the players would get injured before the end of the season. For former Nigeria international and winner of the AFCON in 1994, Victor Ikpeba, he is optimistic of Nigeria's progression from the group. He however warned that the Super Eagles cannot afford to be complacent as some of these smaller nations could be very tricky. He therefore, warned that the players should take every game with all seriousness. The team's captain for the AFCON qualifiers, Ahmed Musa said after missing out of the last two editions the Super Eagles were going to Egypt with all seriousness, just as he said they were ready to take on any team. Host country, Egypt was drawn in Group A against DR Congo, Uganda and Zimbabwe, while defending champions Cameroon will play in Group F, alongside Ghana, Benin and Guinea Bissau. Group D however, seems to be the proverbial 'Group of Death' as Morocco, Cote d'Ivoire, South Africa and Namibia will slug it out. The biennial competition which will be having 24 teams for the first time will kick off on June 21 to July 19.